Here's the opportunity to become partners to sponsor individual race meetings, throughout the season, where they will in return benefit from programme, trackside and website exposure. View our price list and help get the first race of the season on track! Firstly, to announce that the "riverside" pit bays are now available to reserve. Do so by initially viewing the map, once you have chosen what you want, call John Huff on 01992 460895 Ext1, he will tell you all you need to know thereon! Secondly, some of you may know one of MSW's friends stores vehicles on site, the club have been assured that these will be removed prior to race weekends. With LGM X30 Tour on the horizon, the Hoddesdon Kart Club invites all IAME / X30 drivers to the "IAME Winter Cup" at Rye House Kart Raceway on 21st February 2016. With great prizes at stake & some cracking offers to twist your arm, the club & it's associates aim to restore MSA racing at Rye to its former position as London & the South East’s best venue & club meeting. The “IAME Winter Cup” will run concurrently with the first round of the HKC season and with the Club having already secured more investment into the race track, more organisation & television coverage (details tba) throughout the season, who's to say IAME's won't want to race at Rye more often....? As the starting block for many drivers, coaches and teams, the historic Rye House Kart Raceway still to proves a tough challenge producing great racing. The "IAME Winter Cup" set up in conjunction with James Mills - IAME UK agent, will make a fantastic shakedown for those drivers already entered into the LGM series! Local businesses are also keen to promote “HKC 2016” allowing a helpful “prize” fund to get the first race of the season on track! HKC will release a plan of action for the 2016 season prior to the first race & can assure the drivers there will be a huge amount of effort put into this years racing! To receive the report of the officers concerning operations on the Club. To receive the financial report of the Club. To elect the Chairperson for 2016. Anyone seeking to be considered for election must forward nominations by the date shown below. To elect the Vice Chairperson for 2016. Anyone seeking to be considered for election must forward nominations by the date shown below. To elect the Club Secretary for 2016. Anyone seeking to be considered for election must forward nominations by the date shown below. To elect Competition Secretary for 2016. Anyone seeking to be considered for election must forward nominations by the date shown below. To elect the Membership Secretary for 2016. Anyone seeking to be considered for election must forward nominations by the date shown below. To elect the Treasurer for 2016. Anyone seeking to be considered for election must forward nominations by the date shown below. To re-affirm that the Club does not require an audit for the existing accounting year. Approval of the Championship and Supplementary Regulations for 2016. Other Resolutions put by Members (Full details of which will be posted on the Clubs Website on or before 7 days prior to the AGM). We have now updated our teams page. Feel free to contact us if you wish to advertise your race team at no cost! With exciting plans to put Hoddesdon Kart Club and Rye House Kart Raceway back on the map as the South East and London’s best venue and club meeting, the committee is ready to announce the initial change of race dates for 2016; the third weekend of each month. 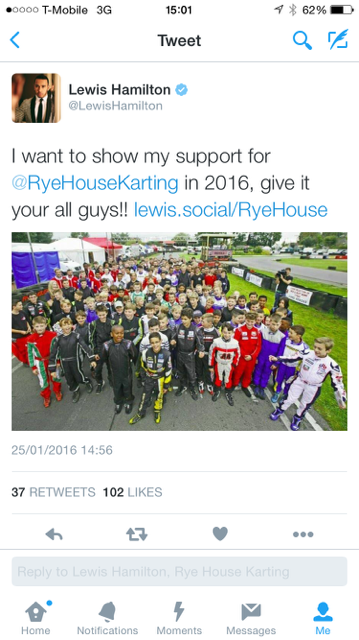 In the effort to improve the grids overall and to deliver an exciting race weekend, the committee has now collaborated with the team at Rye House to ensure absolute support for HKC. Moving into 2016, the club will initiate a plan of action to ensure a clear message to MSA drivers across the board that Hoddesdon Kart Club really is making a broader effort to reform and improve the quality of racing for all! June 7 Race Meeting: HKC welcomes Melbourn Photographic society who will be taking photos for their monthly print competition. There is provision in Club and MSA Rules for such visits which have been approved in advance. This is a closed group and normal rules apply in that anyone who does not want themselves or their children to be photographed at this meeting should advise Race Control who will notify all signed-on photographers. Anyone wishing to take photos or videos at HKC meetings should register at Race Control and will be issued with a wristband to demonstrate that they have signed on. To elect the Chairperson for 2015. Anyone else seeking to be considered for election must forward nominations by the date shown below. To elect the Vice Chairperson for 2015. Anyone else seeking to be considered for election must forward nominations by the date shown below. To elect the Club Secretary for 2015. Anyone else seeking to be considered for election must forward nominations by the date shown below. To elect Competition Secretary for 2015. Anyone else seeking to be considered for election must forward nominations by the date shown below. To elect the Membership Secretary for 2015. Anyone else seeking to be considered for election must forward nominations by the date shown below. To elect the Treasurer for 2015. Anyone else seeking to be considered for election must forward nominations by the date shown below. Approval of the Championship and Supplementary Regulations for 2015. All nominations and resolutions must be made by a Club Member (or PG in the case of a minor) and seconded. These should be e-mailed to the Club Secretary no later than 14 clear days prior to the date of the AGM. Motions may be put under Any Other Business at the AGM.